Located by Vilamoura beach (100 yards) and only a few minutes from the best golf courses in the Algarve, the Dom Pedro Vilamoura Hotel is surrounded by restaurants, bars, pubs, vibrant nightclubs, and lies directly beside Vilamoura’s Casino and international Marina. The Dom Pedro branch of hotels are experts at catering for golfing groups and are always a popular choice of golfbreaks.ie customers. 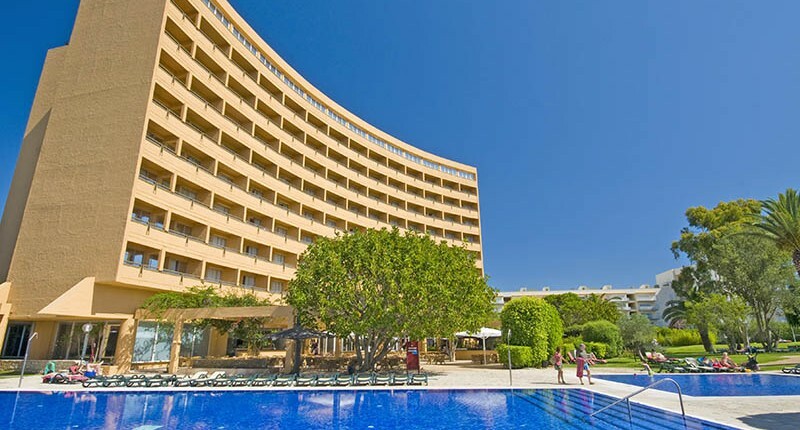 They offer quality 4* accommodation that always impresses, the Dom Pedro Vilamoura Hotel is in an excellent location close to the Vilamoura Casino and only a very short walk from the Marina. Located by Vilamoura beach (100 yards) and only a few minutes from the best golf courses in the Algarve, the Dom Pedro Golf Resort is surrounded by restaurants, bars, pubs, vibrant nightclubs, and lies directly beside Vilamoura’s Casino and international Marina. With 266 rooms, Swimming pools, Kids Club, Tennis and Volleyball courts, Children’s entertainment programme on Summer, SPA and several restaurants and bars, this is the best “ALL INCLUSIVE PROGRAM” for Family holidays. This Double / Twin Rooms are located on the 1st to 5th floors, these rooms have a sitting area with a private balcony overlooking the gardens or the ocean. Located in the upper floor of the Hotel with ocean views, the suites have between 40 to 80 square meters. Although having different shapes, all suites have a common characteristic: an astonishing terrace view over the sea and Vilamoura. This Suites have a modern and charming design inspired in a Zen environment: angular and minimalist shapes mostly in two tones enhancing the outside view. Al with king size beds. Two of this Suites have a Jacuzzi on the terrace. Exterior renovations have created pleasant and modern areas. The new SPA Aquae and outside pools have an organic colour and excellent water quality due to an overflow system. All of the pools are finished in antislip materials, and one of the accesses is comprised of an ample and comfortable staircase, perfect for sunbathing. At night, the colours that irradiate from the pools, chromotherapy, produce a unique and relaxing effect throughout the Hotel’s spacious gardens. Beach area at Vilamoura beach, reserved exclusively for Dom Pedro guests.